ET Issues and Answers: Fix It! It's a Sony CDP-190. I bought it new, '90, '91. It started skipping or something, irregularly, several years ago, and I tried a Cleaner CD and thought that got it. Recently, it got really bad, about 20-30 minutes into a CD. Figured this was <b>it</b>, time to take the cover off. Not a lot in there, it's from the Component Era, mostly empty cabinet, but parts of the CD mechanism were open for examination. There's a guide rod, stainless steel, that the laser travels on. The laser's mount has gear teeth on one side that mesh with a gear that spins, so that's how the linear motion (no lead screw with this) gets done. Anyway, that stuff is all nylon, not built for the ages really. I put a drop of "precision lube" on that guide rod and ran the laser to the extremes back and forth several times, figuring maybe it was binding up on that a little. So, I'll see how that goes. 06JUL2014 - It got better (? ), but there's still trouble. I wonder whether it may be sensitive to bass/vibration. 09APR2017 - Threw in the towel last week, becoming progressively worse. Game Over. R-I-P. Saw a Sony player at <b>Zia</b>, used, $10. A few years ago I bought an LCD TV and I didn't like its picture much after I got it home. It's been serving as a marginal computer monitor. It had been working trouble-free till it started having a problem "turning over" from a cold-start where the default screen would come up, left-half dimmed, and then pop up and go back out. It wasn't getting good spark. I went through a period of futzing with it till that became fruitless. It was powered by an external mini-brick, a 12V, 4A switcher. Its little green LED had begun this odd flickerating. A-ha, bad power supply. 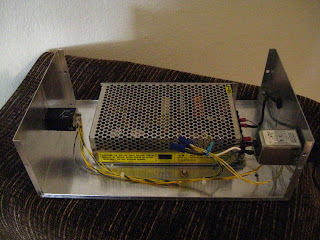 About the same time that I bought the TV I'd also grabbed a nice surplus MeanWell switching supply from bgmicro.com - 15V, 10A. I was using to test a high-power motor. With its adjust pot, it turned it down to 12V, no problem. I cut the output cable off of the bricked mini-brick, stripped the cut end and crimped some forks on, landing them at V_out and Gnd. Taking a deep breath, I switched on the AC to bring up the supply, and clicked the TV's on/off: Bingo. I ran it out of box for a week or so and then committed to placing all in a proper enclosure and so on - with panel-mounted IEC filter/inlet and power switch (both of which I pulled out of "treasure"). It was a matter of laying out tape, measuring and marking perimeters, drilling, nibbling, and filing. The MeanWell's mounting studs were drilled for M4. I think an M4 screw goes in a 4-40 tap OK, but a 4-40 screw in an M4 tap doesn't work. Lucky, I had four M4s from something I'd scrapped out. Some crimping and wire-nuts and it looks pretty good and works great. The switch has nibs for small-pattern quick-ons, which I had none of, so I soldered to those terminals. 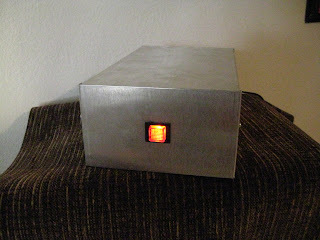 I like it because it's a big push-button, approx 1_in sqr, and it has an integral neon lamp.